Though vaping is often described as a cleaner, more pleasant experience compared with smoking, it’s still not to everyone’s taste. CBD edibles provide the same relaxing, pain-relieving effects, but come wrapped in a tasty package. These gummies are infused with the purest CBD oils available and taste just like their non-CBD counterparts. Right now you can also snag 500mg for 25% off—just $29.99. 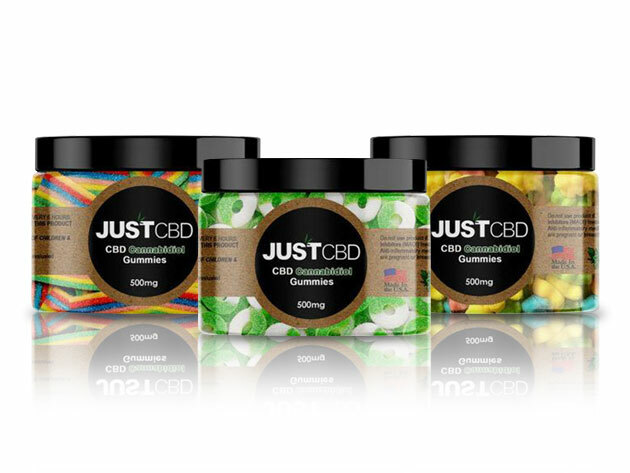 JustCBD lab tests all of their CBD products for purity, and these gummies are no exception. Purity correlates to potency and ensures these gummies will have the desired effect. Many first-timers actually say that edibles create a more soothing feeling than traditional cannabis smoking, which can sometimes cause irritability or other unwanted effects. If you’ve been looking for an ideal delivery vehicle for cannabis, and you love gummies, it’s hard to think of a better option than this. Get 500mg now for just $29.99 after 25% off.